Black Uniform boot. Medium round toe. Dress Vibram Sole. Dressy, but with a little grip. Take off the ankle straps and wear them to work, put the straps back on and wear them out! 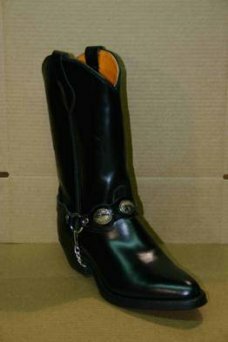 No matter what your size is, we make these boots to fit you! Matching His and Hers available.